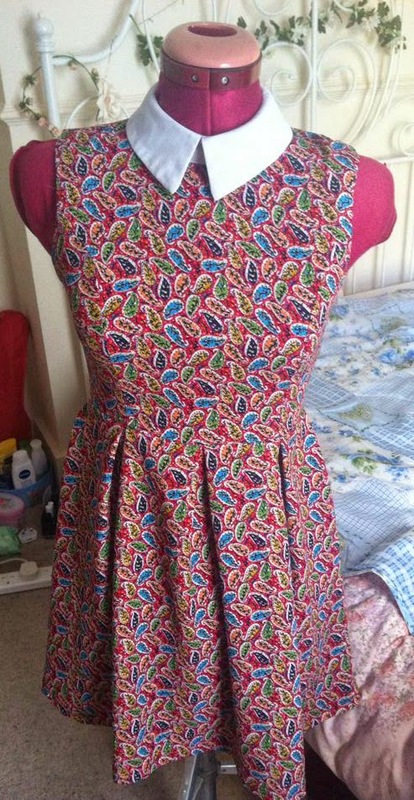 After creating January's inspiration post, I set my heart on creating a patterned summer dress with a conrast collar. Browsing the fabric at my local shop, I came across this Hill-Berg blue/teal polycotton (looks more teal IRL) with white polka dots. I made a toile for this dress as I thought the pattern was quite complex. The bodice uses princess seams which I've never worked with before so it was all quite a challenge. Making a toile is probably the most useful thing ever and I recommend it to all you lazy sewists out there. I'll blog about the toile at a later date but making an old bed sheet into a bodice was so useful for this dress. Pattern cutting is probably one of my favourite parts of dressmaking. For the first time ever, I pre-washed my fabric and properly pressed it before cutting. I think pre-washing definitely took that 'new' feeling out of the fabric and it seemed a bit easier to work with than other times I've worked with unwashed polycotton. Piecing the dress together was super easy and it was coming along nicely. I decided to use box pleats (I think) for the skirt and this took me so long. Measuring, dividing, adding, folding, pressing and sewing. In the end I got the pleats equally spaced apart and looking good. For the collar, I wanted to use contrasting fabric so went with a lightweight white cotton. I decided against using interfacing for this collar as I had had trouble with getting the wrong interfacing for previous collars. The lady in the fabric shop also had a simple, lightweight collar on her top so I thought this would be easier and still effective to create the collar without facing it. With a load of white bias binding, I attached said collar to the dress. This collar was so much easier to do compared to the thicker peter pan collar on my leopard print dress. Phew! The zip also went surprisingly well - again, I went with a contrast white, much like my bird print skirt. Initially, I added a white trim to the hemline as I thought the dress was too short. However, I didn't really like it, and through the power of designing and making my own clothes, I removed it. Anyways, I'm really hoping I get a lot of wear out of this dress as I'm really really proud of it! Hey I'm Jenny and I make my own clothes. Brighton.